$4999$49 and 99 cents$0.26 / oz. $3499$34 and 99 cents$0.12 / oz. For proper hydration, thickened water makes swallowing easier for those who have difficulties. These thickened drinks can contain vitamins and electrolytes to help the body stay hydrated. You can choose from different consistencies and flavors of thickened water from brands such as Resource and Hormel. 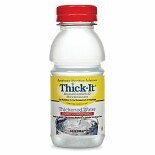 All you have to do to use thickened water is shake it, chill and pour, since it's already mixed and ready to use. 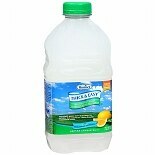 Lemon is a common flavor, since it's refreshing and tastes similar to normal water. Some thickened water contains added sweeteners, and others are gluten-free to meet specific dietary needs. 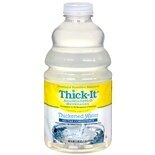 In addition to ready-to-use thickened drinks, you can find thickeners to add to your water or favorite juices. There are also thickened juices in a variety of flavors and consistencies. People with swallowing difficulties can also use pureed food, thickened food and heat and eat meals for their specific needs.